If you’re a regular reader of our #WebsiteWednesday series, then you know the positive impact the #GenXYZ community has made reaches as far across the globe as the community itself. 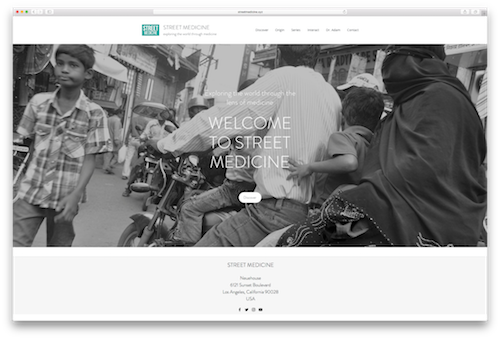 This week, we’re highlighting a #GenXYZ member who is changing the lives of people in impoverished regions around the world through medicine: StreetMedicine.xyz. Dr. Adam Kawalek is a Canadian born physician who now practices medicine in Los Angeles. But Dr. Adam is no ordinary physician, as he is certified in Pediatric and Advanced Trauma Life Support, and Humanitarian Response to Conflict and Disaster, which are skills he has used to volunteer with disaster relief and capacity building efforts in Haiti, India, Kenya, Liberia, and Gaza. StreetMedicine.xyz is the home of Dr. Adam’s forthcoming documentary series “Street Medicine”, and his site features clips from the documentary, the story behind its creation, and interactive photography from Dr. Adam’s travels that help explain what day to day life is like in the countries he has helped. “I never feel so alive as when I travel abroad. It’s a shock to the senses and for whatever reason it wakes me up. And with zero red tape, I am free to practice medicine in its purest form. For me that means spending time with a patient, challenging my diagnostic skills and learning new techniques and medicines. It’s professional and personal bliss. If you’re passionate about an idea, and you have the drive and vision, you can harness the power of your own .xyz domain to bring your idea to people around the world, just like Dr. Adam. Keep an eye on StreetMedicine.xyz for the official launch of the documentary, and stay up to date on the best .xyz use cases by following @XYZ on Instagram.